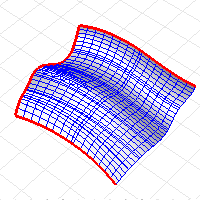 The DupMeshEdge command creates a polyline that duplicates the edge of a mesh. The BreakAngle option specifies the angle in degrees under which mesh faces will be considered one object. Attempts to combine the unwelded and naked edges into logical polylines. It works best on meshes where the choices are obvious and where three or more candidate edges meet at a vertex. Works fast, but it adds each edge as an individual line curve. These can be joined later.